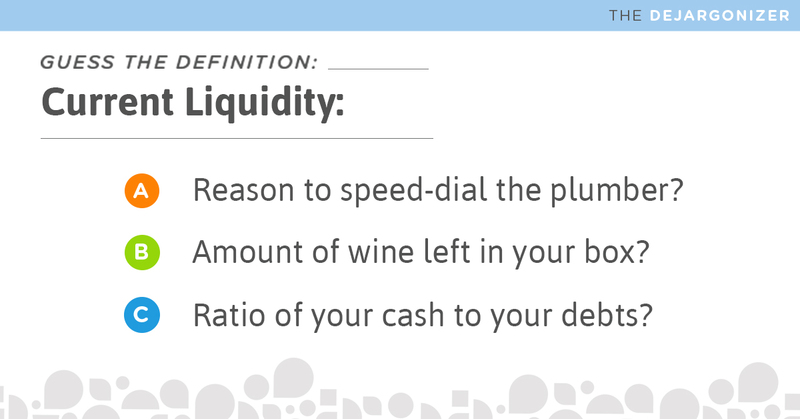 Current liquidity is the amount of cash you have on hand (or can come up with quickly) compared to your amount of debt. The amount of cash on hand is easy to figure out, but assets can also be included in a calculation of current liquidity. This is where it gets a little more tricky. Some assets are easy to turn into cash quickly (think stocks which can be sold within minutes), and some are not (think buildings that may take months or years to sell). Marketability also matters – if there’s an active demand for the asset and it can be sold quickly at a high value, then it’s more ‘liquid’ (even if it’s built out of solid bricks). Each asset can be assigned a degree of liquidity based on how easily it can be converted to cash. The simple answer is that if you have cash on hand, you’re more prepared for emergencies and able to seize opportunities that come along! The slightly more complex answer is that it matters to banks and investors. If you want to get a loan, it matters almost as much as your credit score! Your current liquidity ratio is a sign of whether you or your company will be able to pay off the debt. The current liquidity of your insurance company also matters! If a natural disaster occurs, or even an icy day that leads to lots of car wrecks, you’ll want to know that your insurance company can quickly pay all the claims. Mylo’s licensed advisors can help you find top-rated insurers with high current liquidity ratios (meaning they are financially stable) for your auto, home, health and small business insurance needs! A licensed Mylo advisor is ready to talk.